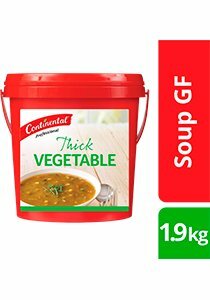 The CONTINENTAL Professional Thick Vegetable GF soup mix is made with real vegetables (green peas, onions, carrots, green beans, potatoes, corn, leeks, parsley, spinach). It creates a hearty and homestyle taste. Every product in the Soup range has been specifically designed for the needs of food service professionals. Servings per package - 132. Serving size - 170 ml.